The theme of the 2018 Philadelphia Flower Show was “Wonders of Water.” Among the highlights: a 10,000-square-foot rain forest, a 25-foot waterfall, and more than 4,000 plants – including 150 varieties and more than 40 cut tropical arrangements. The show must go on. 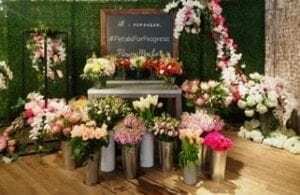 Despite a nor’easter that pummeled Philly and neighboring towns in snow and heavy winds, the 2018 Philadelphia Flower Show drew a strong crowd, with 250,000 visitors checking out the annual show from March 3 to 11. The show, the nation’s largest and longest-running horticultural event, is the annual fund-raiser for the Pennsylvania Horticultural Society, and has a regional economic impact of about $65 million, according to the Philadelphia Inquirer. Given the storm, organizers were “happily surprised and pleased with the enthusiastic attendance,” said Kevin Feeley, the Society’s communications director. 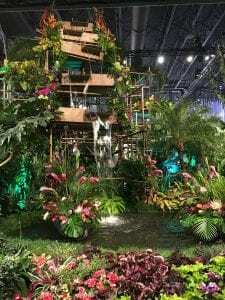 The theme of this year’s show was “Wonders of Water.” Among the highlights: a 10,000-square-foot rain forest, a 25-foot waterfall, and more than 4,000 plants – including 150 varieties and more than 40 cut tropical arrangements. After guests exited the entrance garden, they encountered more floral displays in line with the Wonders of Water theme. According to Feeley, this year’s theme lent itself to more opportunities for designers to use their displays for activism. Among the more educational displays: the American Institute of Floral Designers’ “The World’s Drinking Water” exhibition, the organization’s take on the impact of water shortages throughout the world. Displays focused on India, Papua New Guinea, Mexico, China, Pakistan, and Africa as countries which currently endure water shortages — in many cases, to disastrous effect. Guest speakers this year included Martha Stewart, Smokey Robinson, and former White House floral designer Laura Dowling. Lectures took place at the center of the venue throughout the days, and Feeley said that this particular theme sparked the first Philadelphia Water Summit, an event that highlighted environmental and industry issues surrounding water conservation.